Everyone has to be educated and develop an understanding of the role digital citizenship plays in our everyday lives. There is so much that goes into being a digital citizen; from taking photos of others to knowing when it is appropriate to share something online. Our students are like cowboys living in the wild wild west. Without any guidelines or structure, they can get in a lot of trouble. Armed with a concrete plan for teaching about appropriate use, you can guide your students to become better digital citizens who will learn how to build their digital presence in a positive and productive way. 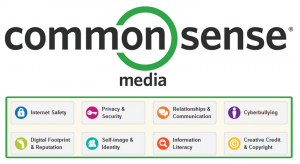 Common Sense Media has lessons and resources available for educators to teach these concepts for free. 1. You must register as an educator on the site; registration is free. You can register here; be sure to click the “I’m an Educator” box. 2. Watch the slide show for your grade level. At the end of the presentation, you’ll receive a link to a survey. 4. At the end of the survey, you’ll receive a link to a certificate you can use to document professional development hours. In order to access the certificate, you will need to have registered and logged into Common Sense Education’s site, which you should have completed in Step 1. 5. Submit the certificate in the submission box below.